When VW released the Golf 4, I was in awe of its technology and build quality, it was a significant step up from the Jumbo Golf. Then came the Mark 5, and yet again VW produced an impressive product. Then came the Golf 6 and I thought to myself, ‘It can’t get better than this.’ And now the Golf 7 1.4 TSI DSG is here, and in the short time that it’s been around, it has already been named World Car Of The Year 2013. Vikash from our office is the proud owner of this fine machine and gave us the opportunity to take it out on a road test. Styling has always been a strong forte for Volkswagen and they did not disappoint in the Golf 7. The 1.4 TSI Comfortline has a sophisticated look, somehow you feel that it has a personality that knows what it’s doing and it knows it’s doing it right. With chiseled features replicating the lines of the VW Polo, you will also find similarities in the headlight cluster as well. The rear has been redone as well following the same chiseled design as opposed to the rounded effect in the Golf 6. Fog lights and 16” alloys are standard for the Comfortline edition. Interior has undergone major reconstruction, taking features and characteristics from the CC. There’s an attractive brushed metal finish to the center console, with the gear lever and steering wheel covered in stitched leather. You won’t find a hand brake lever in this car, that’s because it doesn't need one. The Golf 7 1.4 TSI comes with an electronic handbrake and is controlled by a button just behind the gear lever. The seats are magic, and to top it all this particular model came with heated seats. Sticking with the interior and the center console, you will find a large screen, which will display information on the vehicles stats from the on-board computer and touch screen radio controls. The interesting thing about this screen is that it has a motion sensor that senses your hand approaching and as it gets closer the screen display changes to display buttons that you would press to control the radio and on board computer, and when you move your hand away you get just the stats up on the screen. I would have expected this model to come with key-less entry and push start, but for some reason VW went the traditional route with a remote and transponder key. But we’re not complaining. 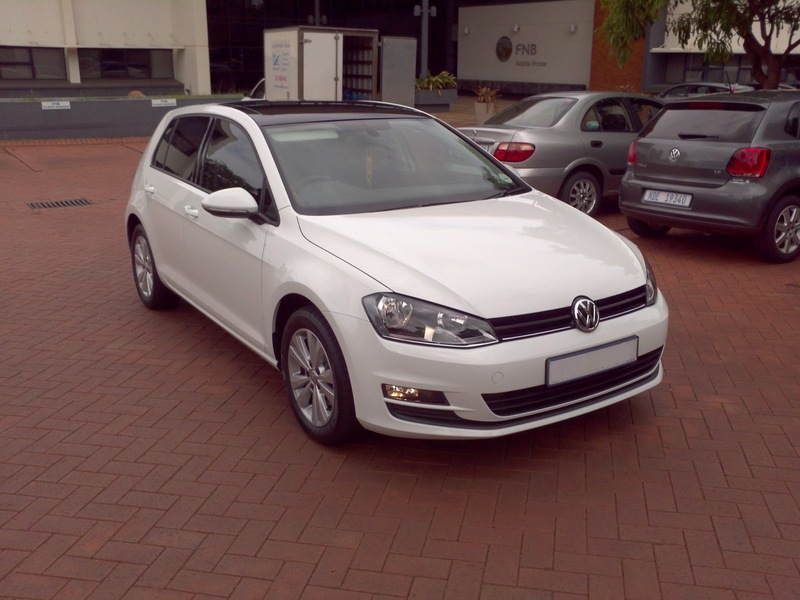 The 1.4 TSI produces 90kw and 200nm of torque, which is more than capable of handling the weight of the Golf body. This combined with a 7 speed dual clutch system makes the TSI untouchable in its class. The electronic handbrake doubles as a launch assist system. When engaged the electronic handbrake will only release when there is sufficient power applied for the car to take off. Another setting will allow the handbrake to engage every time you come to a stop, this can become a bit annoying if you’re in traffic going downhill. Normally you would just play with your brake pedal, releasing it whenever you need to edge forward, but with the assist engaged, you have to touch the accelerator a bit to get the car rolling again. Performance is off the charts and unexpected, so when test driving this car brace yourself, it’s guaranteed to put a smile on your face. VW has put in a lot of technology in the development of their new range of power plants and as a result they have accomplished power and economy. The 1.4 TSI is claimed to have a combined fuel consumption of 5.0l/100kms. In the hilly coastal Durban area we cannot expect the same results, but it will be fairly close to that. The World Car Of The Year 2013 took all factors into consideration when they were gunning for that title, and one of them is the price of the vehicle. For almost the same price as a Golf 6, you can now take ownership of a Golf 7, don’t ask me how they managed to do that considering all the extras and new technology in the new version. The 1.4 TSI Comfortline DSG will cost you R284000 (2013). You will get 3yr/100000km warranty and a 5yr/90000km service plan. Very very nice post.I read your post.The car VW Golf 1.4 TSI Comfortline DSG is looking so beautiful.I think this car will able to cope with others car.So it is a good idea.Congratulations. Performance is off the charts and unexpected, so when test driving this car brace yourself, it’s guaranteed to put a smile on your face.